Hockey Plumber: Alex Ovechkin ‘week-to-week’... How did this happen? Alex Ovechkin ‘week-to-week’... How did this happen? Look at Hockey Plumbers last post. Are we now the "Hockey Prophet"? Although he reads our blog everyday, this isn't an elaborate hoax put together by The Plumber and Ovi. (AP)—"The Washington Capitals say Alex Ovechkin(notes) is 'week-to-week' with an upper-body injury. The Capitals said Monday that the two-time league MVP suffered an 'upper-body strain' in Sunday’s overtime loss to Columbus. Ovechkin had an MRI and will travel with the team while receiving treatment. Ovechkin has missed only four games—and just two because of injury—since coming to the NHL in 2005. He sat out once during his rookie season with a groin injury and couldn’t suit up for one game last season because of a bruised heel. He also missed two games last season to be with his ailing grandfather in Russia. Ovechkin appeared to hurt his left shoulder or left arm during a second-period scrum that started when he was bumped by Jason Chimera(notes). 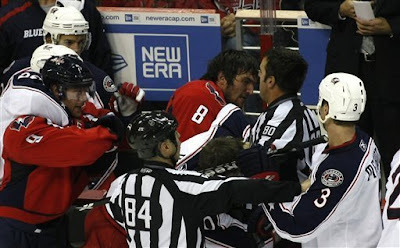 Ovechkin responded with a shove, and players from both teams quickly joined in. Ovechkin stayed in the game, but later in the period became tangled with Raffi Torres(notes) and fell to the ice. He got up grimacing and gingerly skated directly to the locker room." When we mentioned that it may be only a matter of time until Ovechkin gets injured, it was not contemplated that it would be less than a week after. Visit Hockey Plumber EVERYDAY or we will write a story about how YOU will be injured soon!